Brookfield Infrastructure Partners (BIP) was launched in 2008 and grew to become one of the world’s largest owners and operators of infrastructure assets. When we first discussed Brookfield Infrastructure a few years ago we were enthusiastic about their prospects. Let’s check up on them and see what we might expect from them going forward. You’ll recall, infrastructure assets are the basic physical structures and facilities needed for the operation of modern society. BIP’s assets include railroads, toll roads, ports, pipelines, power transmission lines, and communication towers. They move food, energy, freight, passengers, data, products and services around the world. Infrastructure assets can be very attractive investments over long periods of time because they can produce stable and growing cash flows. These roads, railroads, pipelines, ports and other facilities are built to last for decades. In BIP’s case about 90% of the cash flow generated is supported by either regulated or long term contracts often indexed to inflation providing protection from price erosion. When first launched BIP owned electricity transmission lines in Chile and North America; and standing timber in Western Canada and the United States. They identified global infrastructure as a promising asset class with good investment characteristics. A number of interesting growth and diversification opportunities were already identified and some were already being pursued. In Late 2009 BIP participated in the recapitalization of Australian based Prime Infrastructure (the former Babcock & Brown) acquiring a 40% interest. Then in late 2010 BIP merged with Prime Infrastructure. In 2012 BIP’s potential returns for investors was becoming more apparent and secure as it diversified and expanded opportunistically in North and South America, Australasia, and Europe [Here]. Transportation: Transportation assets are geographically diverse with 9,900 KM of rail operations in Australia and South America, 19 South American and Indian tollroads totaling over 3,600 KM and a portfolio of 38 ports in North America Australia the UK and across Europe. 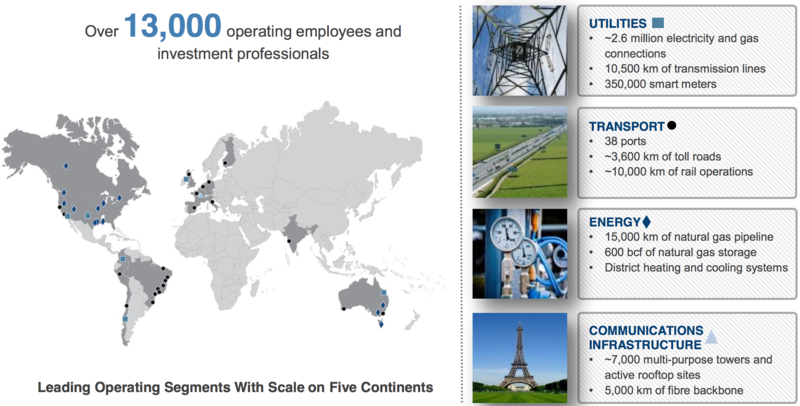 Energy: The energy assets provide energy transmission, distribution and storage services over three continents. These include 15,000 km of natural gas transmission pipelines, 600 billion ft.³ of natural gas storage in the U.S. and Canada, District energy facilities providing 2.9 million pounds per hour of steam for heating and 255,000 tons of cooling capacity in urban areas. Communication: Their communication infrastructure business provide services to the media, broadcasting and telecom sectors and consist of multipurpose and 5000 km of fiber-optic backbone. Now if you’re like me, often when I read about an attractive investment, I’m thinking; ‘its probably too late, another missed opportunity!’ That is not the case here! In our next post we’ll discuss BIP’s prospects over the next few years and update the company’s value. You are encouraged to do your own independent research (due diligence) on any idea discussed here because it could be wrong. This is not an invitation to buy or sell any particular security and at best it is an educated guess as to what a security or the markets may do. This is not intended as investment advice, it is just an opinion. Consult a reputable professional to get personal advice that meets your specialized needs of which the author has no knowledge. This communication does not provide complete information regarding its subject matter, and no investor should take any investment action based on this information.